The Palm was a revolutionary concept in organizer design when it was originally introduced. Using its Graffiti writing system, and a very intuitive interface, the Palm slowly but surely began capturing the eyes of businessmen everywhere. The original Palm didn't meet with much success, but the 2nd edition, the PalmPilot, gained much acclaim and respect everywhere. US Robotics, after getting purchased by 3Com, spun off the handheld unit into the Palm Corporation. Thereafter, the Palm has been through numerous revisions and modifications. Palm even went as far as licensing the design specifications and operating system so that 3rd parties could create their own Palm devices. At the time, Microsoft had some versatility gains up on Palm's devices, with Internet connectivity and other device functionality. This is where vendors like Visor and HandEra stepped in. Visor created a stylish Palm, called the Handspring, with modular hardware add-ons available. HandEra originally had its business by performing custom memory upgrades to beef up application space on Palm III units. Later, bringing with them an intimate familiarity with the Palm III and IIIx, HandEra moved on toward making its own customized Palm-based PDAs. Today, we take a look at the TRGpro from HandEra. As a note, when we obtained our review unit of the TRGpro, the company was known as TRGpro. They have since changed their name and introduced a new unit, the HandEra 330. While some might saw that it's pointless to look at the TRGpro when its successor is just over the horizon, it should be noted that the TRGpro is still a very useful device and quite a bargain at its price point of $249, making it an attractive investment for geeks and IT departments alike. We will be reviewing the HandEra 330 in the near future. To begin, let's have a look at the specifications of the TRGpro. CFPro utility for moving applications to and from CF storage devices in TRGpro. The specifications and appearance make the TRGpro seem to be just like your average Palm IIIx. While this may be true, the TRGpro is far from your average Palm IIIx. For starters, the Palm IIIx features a memory upgrade, bringing the total capacity of the unit to 2 MB of OS space and 8 MB of application/data space. The TRGpro also features integrated audio hardware that allows for .wav playback capability. By far, however, the most outstanding characteristic of the TRGpro is the integrated CompactFlash+ slot featured at the top of the unit. The most versatile aspect of the TRGpro is the CompactFlash slot located at the top of the unit. If you're already familiar with digital cameras, then you may recognize that CompactFlash is the most widely adopted flash memory standard for digital cameras. CompactFlash is rugged, but features current memory capacities of up to 400MB of data. The advanced revision of the CompactFlash specification, called CompactFlash+ or CF+ for short, provides an even more advanced interface, allowing for the use of card-powered peripherals such as serial cards, modems, Ethernet adapters, and more. Furthermore, using the power supply in the CF+ slot, more advanced data storage devices can be manufactured, such as miniature-profile hard disks. Most prominent among these offerings is IBM, with its Microdrive offerings between 340 MB and 1 GB using a half-platter and a single drive arm. The TRGpro is able to take advantage of these devices using its built-in firmware drivers and the AutoCF program. AutoCF acts as a CompactFlash cataloguer, identifying devices and configuring them for use with the TRGpro. Once configured, the devices are ready for use. Installing applications to support the devices is left up to the user, however. The TRGpro is designed around the user who knows what he or she is doing - If you're using a CF serial card or a barcode reader, for instance, it is assumed that you have an application ready to interpret the data from the device. HandEra doesn't supply this software, but instead the hooks to use the functionality. This is no fault of HandEra's, of course, since they simply supply the middleware. With the capabilities of the CF+ slot in the TRGpro, the simple handheld organizer turns into a veritable Swiss Army Knife of PDAs, with the capability of handing all sorts of customized industrial and informational applications. For instance, add a barcode reader and the TRGpro turns into a portable inventory tracker to be used in retail or warehouse environments. Put in a Digital Cellphone translator card, and use a digital cellphone to connect to an ISP and perform a remote HotSync or send some e-mail. Put in the Ethernet adapter, and you have a portable network terminal or a miniature web-browsing platform. The last sentence of the previous paragraph details my interest in the TRGpro. I was already impressed by the 3rd party developer support for Palm-based devices, having a few friends in the Palm software industry. I had long carried interest in the Palm due to its wild popularity and functionality as compared to Windows CE-based handhelds, but when I found this device, I knew that it represented everything I had ever wanted in a Palm. I could have the excellent information management tools provided by the standard Palm apps, as well as Internet and device connectivity. The possibilities for this little guy were staggering. For testing purposes, I only had two CompactFlash cards at my disposal: a couple of 8 MB Sandisk CF memory cards, and a Socket CF-E Ethernet Adapter. The TRGpro worked perfectly with the Sandisk memory cards, but my results with the Ethernet adapter were a different story. More on that later. When I mention the ability to store data on the TRGpro using a CF memory card, someone invariably will ask "So what's the big deal about that?" In fact, it's quite a big deal. I found it to be useful within two days of receiving my unit from HandEra. Due to a defective carbon unit, I had problems over the first two days with the batteries falling out of the TRGpro. Eventually, I discovered that the battery panel cover wasn't being closed all the way, and so the panel would just casually pop open periodically. However, as the batteries would fall out, all my data would be lost from the unit, and I'd have to HotSync again to recollect my contact data, as well as write in any new information. Using one of the provided applications, CFBackup, the TRGpro is capable of easily backing up all of your contacts, memo notes, e-mail, and applications to a CompactFlash memory card. Once I replace the batteries, I can simply restore the information from the memory card. In fact, I got myself into the habit of backing up the unit every time I went to turn it off. After installing AvantGo, Frotz, Acrobat Reader, and a few other applications, I had accumulated 4.1 MB of data. Backing up of all that data to the CF card took a mere 14 seconds, far less time than a HotSync using the serial cradle. Restoring data from the card takes the same amount of time, making restoration time a snap. Even better, if you just need to restore a certain portion of your data, such as your memo notes, you can selectively restore items in CFBackup. Another useful application included is CFPro. CFPro allows you to migrate Palm applications and databases back and forth from the RAM to a CompactFlash card. CFPro allows you to install more applications than the normal amount of memory allows by allocating some of the CompactFlash card's space as useable system RAM. CFPro also allows you to install Palm applications from a CompactFlash card, in case you're nowhere near your cradle. Say, for instance, that you've found this nifty new expense manager. Simply download it onto the CompactFlash card, and then use CFPro to install the application from the CompactFlash card directly into RAM. Or, you can use CFPro to install it into the CompactFlash card and run the program directly from the CompactFlash card. 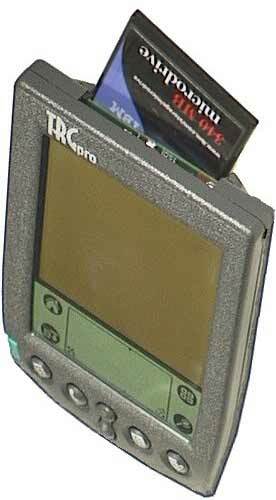 The TRGpro also includes FlashPro, an application that allows OS upgrades to be performed via the CompactFlash slot. The idea is simple - Just copy the OS upgrade file to the CompactFlash slot, and then execute FlashPro to copy the upgrade into the OS RAM. The Palm reboots, and its instantly upgraded. 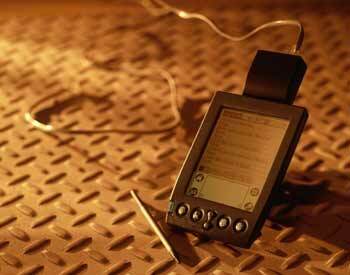 Previously, the OS could only be upgraded on a Palm by HotSyncing with the cradle. FlashPro allows the user more versatility, in case the cradle is inaccessible in the user's current location. Granted, the odds of having to use this application are rather low, but it's still a very helpful maintenance program for developers and hardware hackers. Compatible with Palm III and IIIx accessories/cradles. While my end experience using this unit wasn't as spectacular as I had hoped, it doesn't detract from this device's usefulness. Given that the Palm is a relatively easy platform to develop for, there's no reason why this device shouldn't be on every Geek's and IT manager's wishlist for Christmas. Well, maybe there's one reason. With the introduction of the HandEra 330, several of the downsides of the TRGpro have been fixed. For instance, the CF slot is now in a separate assembly from the IR transceiver, so you don't need to open the unit up to install a card. Furthermore, the HandEra 330 is capable of using a rechargeable battery pack, which would have been nice with the TRGpro. Priced to move at $250. Get it at Handera's website.